THINGS NEVER HAPPEN WHEN YOU LOOK FOR THEM. Three key principles that have always worked for me. I spent the first 40 years of my working life in the wonderful worlds of advertising and qualitative research. But I really wanted a change. And I wanted that change to be something completely different. Maybe using some of my skills but in a totally different industry. Something that I loved doing that could become a business. But known to travel to Scotland for a particular pair of socks, finding 'it' wasn't going to be easy. . . I have always had a creative streak but never quite knew how or where to apply it. Touring a few ideas in my search, I even trained to be a barista. I LOVE good coffee and had a vague dream of serving only the best. In a little cart on gorgeous beaches somewhere exotic. But then my husband reminded me that we live in the real world. Decoupage came closest to being the 'one' when I started to decorate bamboo platters with old advertising/marketing materials. But my passion halted somewhat when I did a massive one for my elder son's 21st, using various memorabilia. I concluded that my style of decoupage may be a fun hobby - but not a 'business'. It all came together when I did a short course learning about applying design to ceramics. I loved the process and potential for great results and had the idea to work with a collection of one of vintage plates I had at home . I love vintage 'one offs' and have a particular passion for wandering around boot sales, junk, charity and antique shops. 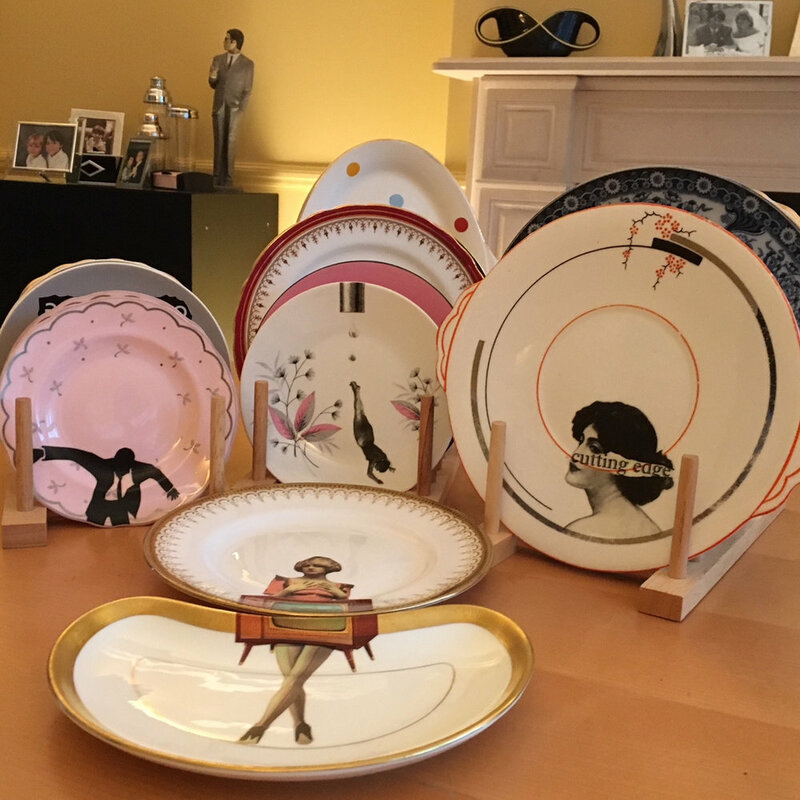 I also love quirky, playful imagery and the ‘leap’ came to me when I thought about the contrast of unexpected, witty imagery on pretty, traditional plates. 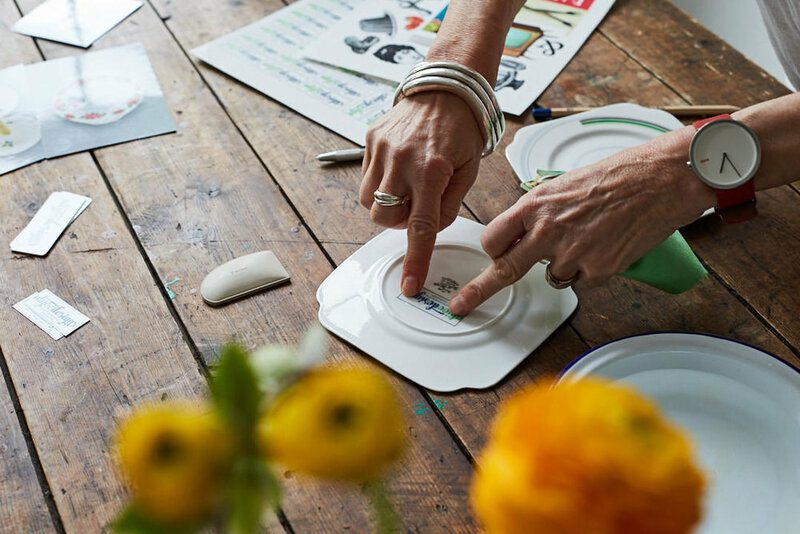 From searching for plates, through planning the design to suit the plate, to sourcing the images, and finally, to creating and applying the ceramic decal transfers. I soon found myself lying awake at night thinking about the design for my next plate and realised that I was feeling more passionate and driven by the experience than I had done by anything for a long time! 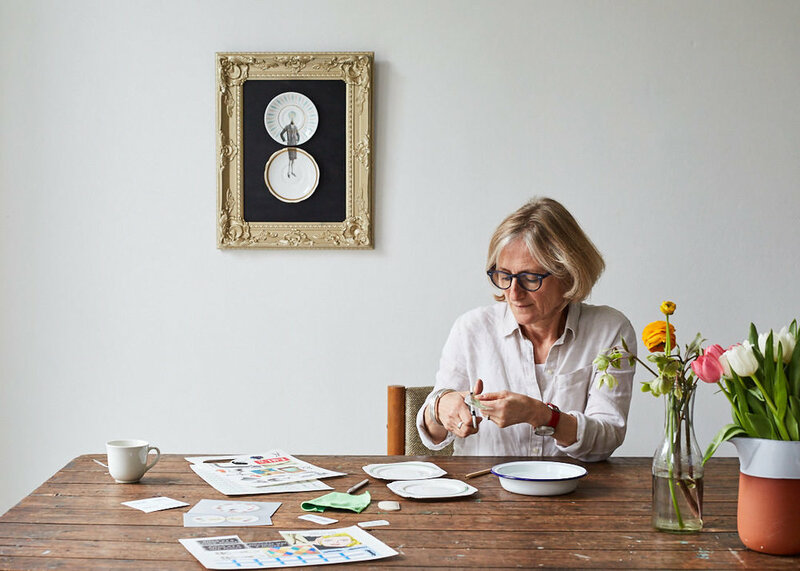 I gradually built up a display of the plates on a wall at home and bowled over by the response, and being asked for custom orders, I realised that maybe I had actually found my creative niche. The images on the plates are often surreal, sometimes kitsch and always quirky - the original, witty and whimsical designs designed to give a sought after contemporary twist to the classic, decorative plate. I draw inspiration from a variety of sources, be that via specific artists such as Fornasetti, Savignac, Warhol, Terry Gilliam, Lichtenstein or Schwitters, visiting exhibitions, simply wandering the streets of London and beyond or attending courses. My eyes are always peeled and whatever I'm doing these days, I'm always thinking about designs for my 'next plate' - watch this space! The name was conceived on a country walk one Christmas many years ago - it combines the nickname of my elder son, (Alex= Ali) and the second name of my younger son (Ollie Joe). The boys were planning to set up a local Sunday delivery service for fresh croissants and bread, and Alijoes was going to be the brand name. Needless to say, Sunday morning lie ins and social lives took precedence over 6.00 am baking. But the name lives on and is now proudly fronting my very first shop. . .